Lionsgate's Power Rangers reboot is shaping up to be one of next year's most anticipated movies, arriving in theaters March 24, 2017. The first trailer debuted at NYCC this fall, with the next batch of footage to drop at any minute. Today, we have new details on the story, confirming that the Putty Patrollers from the original series will return in this reboot. Here's an excerpt from the report, which reveals more about the Putties place in the movie. "Putties will make an appearance in Power Rangers in a scene where Rita Repulsa is trying to steal gold bullion from the Central Bank of Russia. Five Putties made of stone in a later scene challenge the Rangers." In the original Power Rangers TV series, the Putty Patrol was an army unit used by Rita Repulsa, who regularly challenged the Power Rangers. These soldiers were not necessarily strong or intelligent, but they often appeared in much greater numbers, which made it challenging for the Power Rangers to defeat them all. This report also confirms previous speculation that Rita Repulsa is a "former Green Ranger gone rogue," along with reports that the character Goldar will return from the original series. Here's an excerpt from the report about how Goldar is brought into the story. "Goldar's molecular essence is scattered around the globe after he was vaporized into a cloud of microscopic gold particles in the opening action sequence on Ancient Earth. Rita Repulsa collects gold to resurrect Goldar... and the Rangers have just 71 hours to stop her." This also confirms reports that the opening sequence of the film is set 65 million years ago, in an era known as the "cretaceous period". where Rita Repulsa is battling the Rangers, before the Red Ranger, Zordon, creates a black hole and sends her through it. Goldar was created to steal the Zeo Crystal, with Rita Repulsa bringing him back to life to find this powerful crystal. Here's an excerpt from today's report about how powerful the Zeo Crystal truly is. "The Zeo Crystal is an artifact that channels the Morphing Grid -- a dimension that weaves through all things and what gives the Power Rangers their power. The crystal was hidden on Earth to keep it out of the hands of those who would use it as a weapon. The Zeo Crystal is protected by a force field. Anything that comes in contact with it is vaporized. 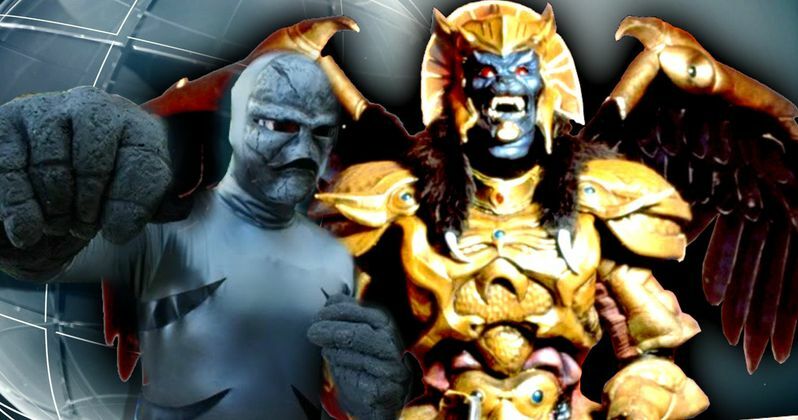 Goldar was created with a single purpose -- to penetrate the force field and steal the crystal. Rita Repulsa has been trying to deliver the Zeo Crystal to her master, Lord Zedd, for a long time. It would make quite a statement, as he burned half his face off trying to steal it himself." This report also reveals that Bill Hader's Alpha 5 is a robot with a "supple metallic body" that can be transformed into different designs, while also confirming that Bryan Cranston's Zordon was the original Red Ranger before being transformed into, "a state of pure energy." Power Rangers stars Becky G (Yellow Ranger), Naomi Scott (Pink Ranger), RJ Cyler (Blue Ranger), Dacre Montgomery (Red Ranger) and Ludi Lin (Black Ranger). The story follows follows five ordinary high school kids who must become something extraordinary when they learn that their small town of Angel Grove, and the world, is on the verge of being obliterated by an alien threat. Chosen by destiny, our heroes quickly discover that they are the only ones who can save the planet. But to do so they will have to overcome their real-life issues and band together as the Power Rangers before it is too late.